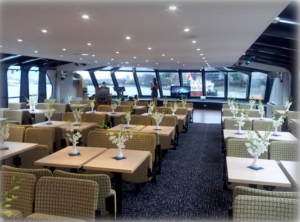 The Kent Club for London Freemasons is going on a boat trip on the Thames – and to make it extra-special, we’re adding dining and dancing to it! How a-boat a Thames cruise? Join us aboard for an unforgettable evening. 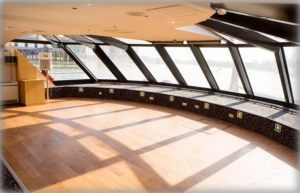 The Millennium features a spacious dance floor, a built-in sound system, two bars, panoramic windows, and is wheelchair accessible with separate disabled toilet facilities. Wine, dine and dance on this great dinner cruise on the Thames, see spectacular views and enjoy show songs and top hits sung by a live performer! Your evening begins the moment you step aboard and are handed a welcome glass of sparkling wine. Dress code is smart casual – no blue jeans or trainers, but jacket and tie optional.